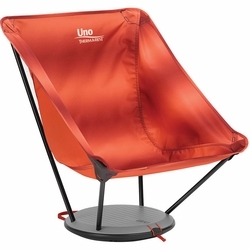 Therm-a-Rest Uno Chair. Looking for the perfect chair for the summer festival season? Check out the Uno, a sleek, seating solution that sets up at just the right height for festival regulation and packs into its own disk-shaped base so you can slip it into your backpack with ease. If that’s not already cool enough, the multi-functional Uno can also be converted into a sweet little side table for camp convenience. Packable: Chair packs completely into its own disc-shaped base with integrated closure/carry handle. Festival Ready: 21” seat-back height is low-profile for outdoor events. Multi-Functional: Converts into a side table for camp convenience. Strong: 250lb capacity with 6000-series aluminum poles.